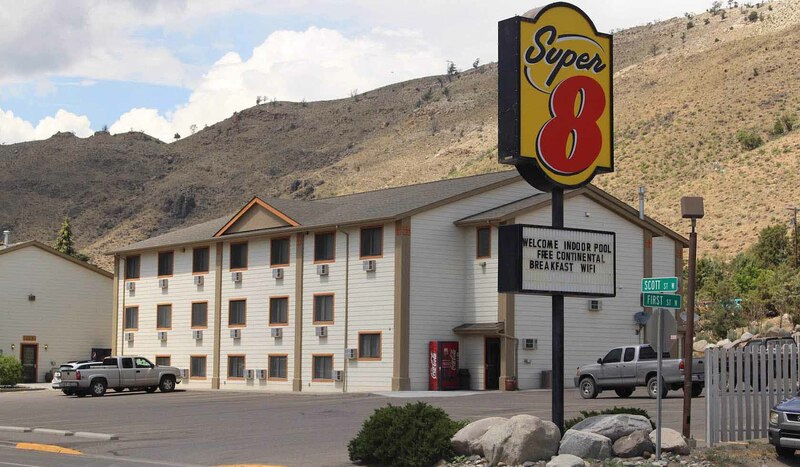 The Yellowstone Super 8 is conveniently located right outside the north entrance to Yellowstone National Park in Gardiner. This is the only year round entrance open to automobile traffic and wildlife viewing in the Park. Mammoth Hot springs is located just five miles from Gardiner. We offer 66 clean and comfortable rooms with Queen and King size beds available. We have three mini family suites with microwave and refrigerator and three queen beds, as well as one full kitchen suite with three queen beds and two bathrooms. We offer an indoor heated pool, laundry facilities, free Wi-Fi, free continental breakfast and friendly service with a smile always. Summer activities include horseback riding, white water rafting and bus tours are also available. Our winter activities include cross-country skiing, snow coach rides into the Park, snowshoeing and best of all, wolf, bison, elk, and other wildlife watching and photography all winter in Yellowstone National Park. Our desk is 24 hours a day during the summer and 16 hours a day during the winter with an on call manager available all night on the property. Children under 12 stay free. Reservations are recommended during peak season with a 24 hour cancellation policy prior to arrival. Call toll free at 800-800-8000 for reservations, or contact us via the Internet at http://yellowstonesuper8.com or email us at super8@wispwest.net. SAVE UP TO 15% by booking DIRECTLY with us! See you soon!